Weekend before last we went to the Pecan St. Festival in downtown Austin. 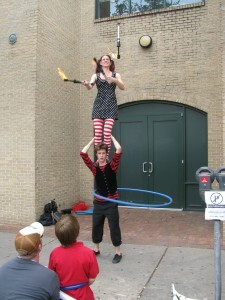 It was several blocks of vendors, artist, and performing artist along with food, petting zoos, and bounce houses. We met up with our friends Goeff & Elizabeth and their friend Stephanie and wandered our way through the maze of amusements to be seen. 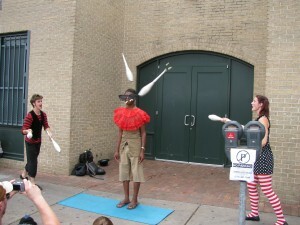 I wanted to share some pictures of the street performers we happened across. They were extremely talented and humorous but kept it at a family level. 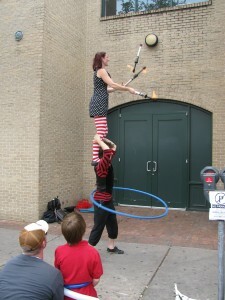 The pictures below are of them: the woman juggling fire torches while standing on the man’s shoulders while he hula hooped and they both simultaneously rotated in a circle. You don’t see that everyday. We left a tip. And here they are knocking a bread stick in half while in the mouth of an innocent bystander.